The QPF fixed skylight, designed for self-flashed installations, is perfect for visually expanding areas such as hallways, stairwells, and other closed-in, dark spaces that can be transformed with light and sky views. It provides an economical choice in creating a spacious home that is filled with natural light. 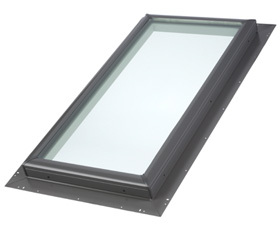 QPF 2222 - VELUX Pan-flashed Skylight - 22 1/2" x 22 1/2"
Remove This Item Rough Opening: 22 1/2" x 22 1/2"